Holy Trinity Church is in a lovely part of London, on a road "cutting through the former grounds of the Royal Horticultural Society" (Weinreb et al. 664), near the Royal Albert Hall. The building is Bodley at his best. James Curl writes, "Bodley's work was ultra-refined, delicate, intricate, and late in its Gothic chronology." This is not apparent in his early work at St Michael and All Angels in Brighton, but here at the other end of his career, says Curl, he achieved in this "essay in English Second-Pointed of the fourteenth century," for which he exhibited a drawing at the Royal Academy in 1901, "a sumptuous work of great serenity, anticipating a return to English precedents of the late-Decorated and Perpendicular styles by twentieth-century designers such as Sir John Ninian Comper" (Curl 111-12). The church's own website praises the "loftiness of its interior and [its] lavish fixtures and fittings" ("History"). 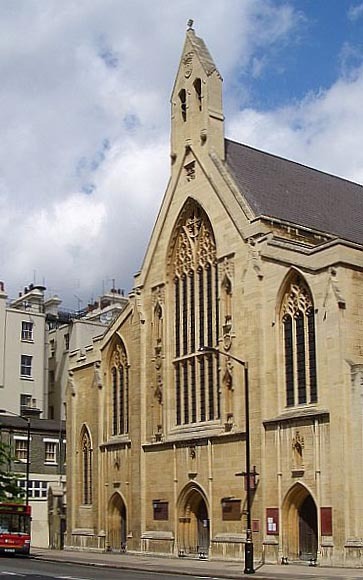 Although it was consecrated in 1903, work continued on the church after that, with the Lady Chapel and "North" aisle not being consecrated until 1906, and the vestries being completed in 1907. Curl, James Stevens. Victorian Architecture. Newton Abbot: David & Charles, 1990. "History of Holy Trinity Church." Holy Trinity Church website, which has photographs of the interior. Viewed 24 July 2010. Weinreb, Ben, et. al. The London Encyclopaedia. 3rd ed. London: Macmillan, 2008.